Kelly is our Office Manager. She has been with 1ST IMPRESSIONS Orthodontics since 2007. She is a graduate of PIMA Medical Institute with honors. 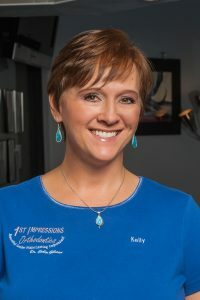 Kelly helps create beautiful Smiles with her bubbly and compassionate personality. Her leadership inspires the best from her team. In her free time, she loves traveling, hiking, going to the movies and participates in several community benefits throughout the year.